Their “Alpha” bicycle was rapid-prototyped entirely on campus and will make any cycling fan weak in the knees. Geek cyclists, eat your heart out: engineering students at UPenn have reached inside your collective consciousness and pulled out the stuff of dreams to create Alpha, a concept bike so sleek and tech’d out you’ll gladly cut off a pinky just to take one ride on it. The student team has created a showcase website for Alpha with so much detail you could probably build one yourself, but the basic idea was “to create a bicycle that would push the boundaries of integrated systems”: a fully enclosed drivetrain, an electronic clutch to flip between freewheeling and fixed-gear configurations on the fly, and an onboard computer for tracking cycling stats, all encased within a custom-machined carbon fiber and aluminum frame. Practically nothing on the bike is exposed to the elements except the pedals. Next, the electronics suite. Alpha’s onboard computer, handlebar-mounted LCD screen and LED lighting all need juice, which is provided courtesy of a drum brake and dynamo on the front wheel hub, as well as two capacitors charged by the spinning wheel. The LCD screen displays real-time data on cadence, distance, speed, and gear status. If you’re into personal datavis, you can pop out an SD card from under the Alpha’s handlebars and download the info onto your PC. 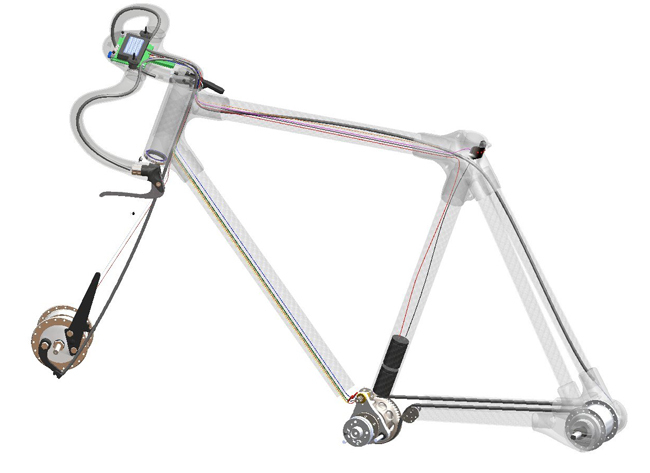 Finally, the SWIFT drivetrain (which stands for Switchable Integrated Free-Fixed Transmission). This is the magic between the pedals that lets the Alpha be all things to all riders: a take-any-grade-in-stride freewheeling geared bike, or a quadricep-punishing fixie. (Or both during the same ride, as your mood or company changes.) I’m not enough of an engineer to understand exactly how this little knot of bronze, steel, and titanium actually pulls off such a feat, but the fact that these students designed it into a package that doesn’t look like a hairball coughed up by Optimus Prime is impressive enough. The UPenn team had nearly 30 corporate sponsors and manufacturing partners backing them up, so I’d be surprised if we didn’t see ideas from Alpha gracing bike shops in a few years.